The collective art conscience of Angelenos overwhelmingly concurs that LA Louver is the (still-kickin’) ‘grandfather’ to the brood of high-profile name-brand galleries that began to take root in Los Angeles during the postmodern era of the 70s. Today, the same is true as when we were kids – Grandpa knows best. LA Louver is putting its money where its mouth is by exhibiting new works by Enrique Martínez Celaya on not one, but both floors of its beautiful, ocean-side gallery in Venice – an honor last bestowed to artist David Hockney. Internationally recognized Cuban American artist Celaya is certainly as deserving of this privilege as Hockney, even if (and especially because) he is not yet a household name. 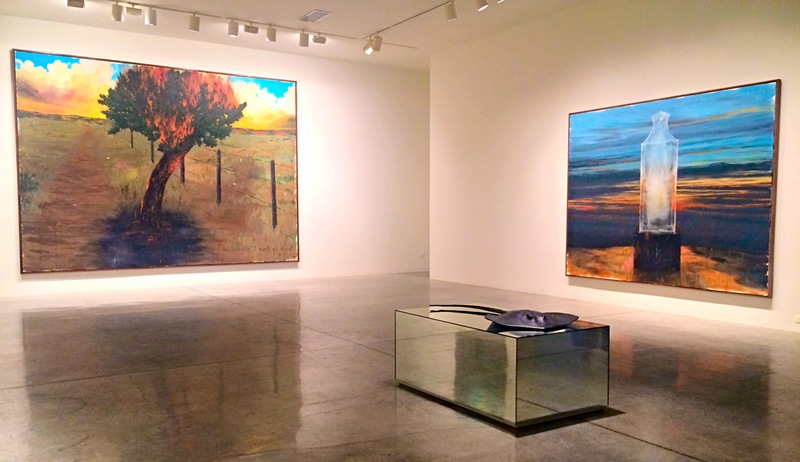 Celaya’s massive new paintings overwhelmed me, and not simply due to their size. Each is laden with symbolism worthy of the Surrealists; like so, it is up to the viewer to tap into our own imagination to connect with these windows into Celaya’s world. The only nudges toward a narrative take form not in imagery but in words – intriguing, scrawled phrases half hidden in some of the paintings. “This is where I made my stand” is written in the bottom right corner of the painting, “The Sigh”. Yet, though I have a propensity to go weak in the knees in the presence of a strong painterly brushstroke such as his, the real power of Celaya’s artworks lie in his bronze sculptures, used to the most creative effect. 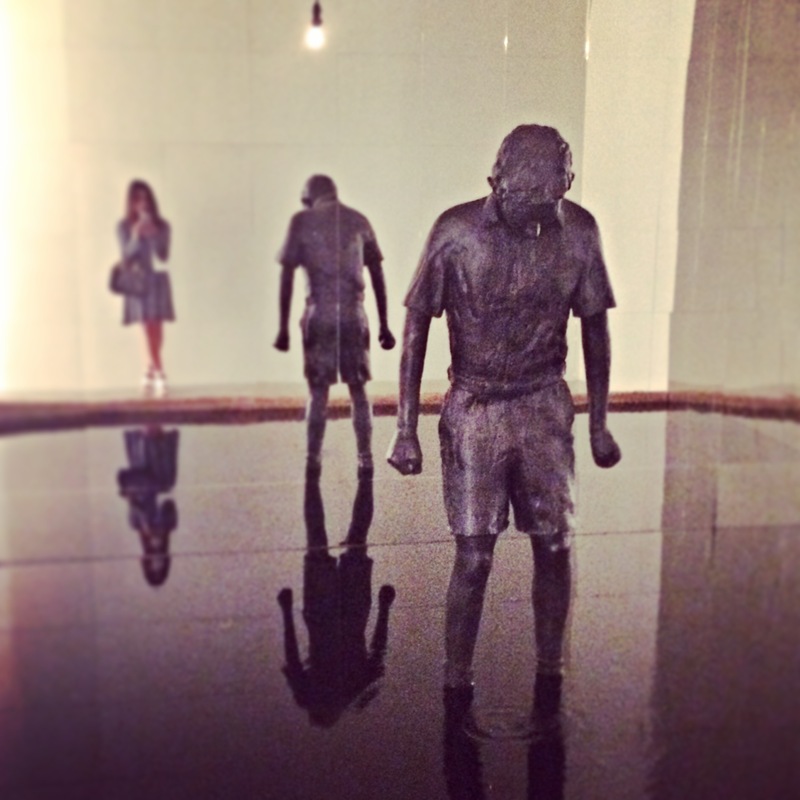 In one dark gallery, tiled with mirrors and lit with a single lightbulb, a bronze sculpture of a young boy with fists curled by his side and head bowed stands in a shallow pool of water. This sculpture is in fact a fountain, and we hear the sound of his tears hitting the water he stands in again, and again, and again. In this immersive space, our own presence is not to be discounted in the young boy’s despair. The unnerving quality of this work, “The Invisible (or The Power of Forbearance)”, is still vivid in my memory and I think of this piece often. After visiting Studio Enrique Martínez Celaya a few months ago, I knew he wouldn’t disappoint with “Lone Star” at LA Louver. Stay tuned to read my blog post about visiting Enrique Martínez Celaya’s massive new studio in Culver City. “Lone Star” is on view through May 16, 2015 at LA Louver Gallery. Excellent piece on this Cuban American Artist, Bianca. The best of luck with your new blog. You go girl!